Holi is the festival of colors and it is great to celebrate this joyful festival with your friends, family and loved ones. So if you are planning to throw a colorful holi party at home then here are some tips for you which can made your party more fun filled and exciting with proper planning and execution to have great fun. -	Venue: First fix the venue of your party preferably chooses open venues where you can get lot of space to run and hide while playing with colors. Lawns and grounds are the perfect location for a Holi Party where you get lot of open space to enjoy the festival without spoiling your wall paints. -	Guest list: Prepare guest list in advance as it will help you to manage your party in better way. It is very much important that the invited guests should known to each other so that all of them can have good time and you can also relax yourself to enjoy the party. Always invite the guests according to the space available at your selected venue. - Design invitation: Holiday party invitation should be colorful and inviting. Self design invitation cards will be ideal for the occasion. Make it as much as colorful you can to emphasize on the party mood. Specify the venue and time of the party very clearly on card, you can also mention the dress code for the party or ask the guests to dress up in white for an additional fun. -	No party is complete without a perfect music and no holi party is complete without good music. You can arrange some live music, a dance floor and DJ where guests can put in requests for their favourite songs to be played. For small holi parties popular Bollywood Holi numbers or high beat folk and western numbers will be suitable. You can also play traditional dholak and folk songs on Holi to bring desi flavor in your party. -	Food menu for Holi party should be handy include some finger foods and snacks like vegetable pakora, Dahi Bhalle, golgappa also known as panipuri, aloo chat and lots more other dishes which are easy to make or can be purchased from the market directly. For main course add something like biryani with dips, Chole Kulche, puri-aloo or any other thing which is easy it serve and cook as well. -	Sweets for Holi party: Sweets are must to celebrate any occasion so have lots of sweets preferably traditional sweets especially prepared on holi like gujia, malpua, rabri, kheer, burfis can increase the joy of celebration in traditional style. -	Drinks for holi party: No party is complete without drinks for Holi party thandai , milkshakes and lemonade are good choices. It is good not to serve any type of Alcohol in parties but if you want to add some more fun than bhang can be a good choice. Use bhang in drinks, sweets, milkshakes to serve. 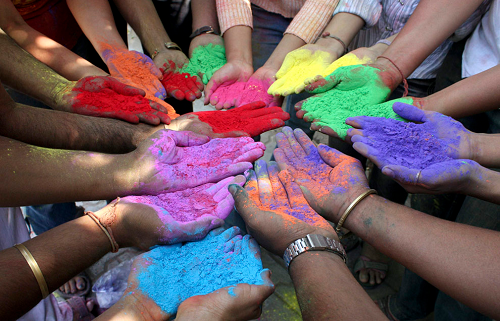 -	Water and colors: Holi party without water and colors is just like a dish without seasonings. Use organic colors or Homemade holi colors which can be easily prepared or available in the market these days to avoid any skin irritation or injuries. It is good to go have continuous supply of clear water so that the contaminated water can be disposed of simultaneously. Arrange for water guns, buckets, or inflated tube pools in so that the guests enjoy themselves to the hilt. Keep a dry plate of colors on every guest's table for easy access. You can also use flower petals to play Holi. -	Holi party gift ideas: After a grand holi party it's time to say goodbye to friends and relatives and a right gift can express your love in the best way to your special persons. You can gift home decorating accessories like flower baskets, carpets, curtains, holi party photos, dry fruit trays and lots more other options as a token of love and care. Hope the above tips will help you to throw the grand holi party which you and your friends will never forget at least until the next holi party for sure.